Nearly 700 students from Secondary School Kien Thiet perform spectacular attacks of Vovinam martial nation to send to teachers as thank you from the bottom of heart. 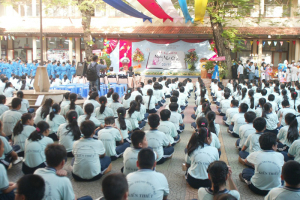 On November 20, the Kien Thiet Secondary School (223/4 Nguyen Dinh Chieu Street, Ward 5, District 3) organization program day honoring Vietnam Teachers’ Charter school like any other. However, the teachers of the school were extremely touched by the very special gift of his students brought it monitors electrical current rather Vovinam martial arts spectacular and grandiose.